Return of the Silver Surfer.External subwoofers and sophisticated cases are the trademarks of the Asus N-series. However, neither the concept nor the design of the notebooks has really changed over the last few years – our review of the Asus N751JK-T4144H shows why there are even small regresses this time. The aluminum lid still looks very nice. We always start our reviews with the case and this is also the biggest change in the Asus N751JK. There was not much criticism for the chassis of the predecessor, even though it was already one year old: It was timeless and elegant, and thanks to the aluminum, had left a very sophisticated and sturdy impression. However, Asus has decided to rework the case and we think there are some positive and some negative effects on the overall impression. 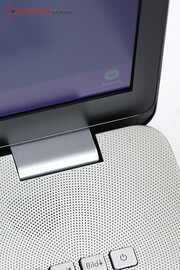 A large part of the case is still made of high-quality aluminum. 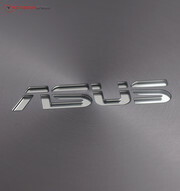 The lid, for example, is made of dark-gray metal and the Asus logo is in the center of the round brushed pattern. You can find metal on the inside as well, the whole upper part of the base unit including the palm rest and the area around the keyboard is matte silver and slightly roughened. Above the keyboard is the familiar circled drilling pattern that we already know from previous Asus N-devices. However, the majority of the dots are now painted on the surface. The speakers are also located underneath the pattern this time, and those holes are real. We still like the design, the display cover looks very elegant and impresses with its rounded corners as well as sophisticated haptics. 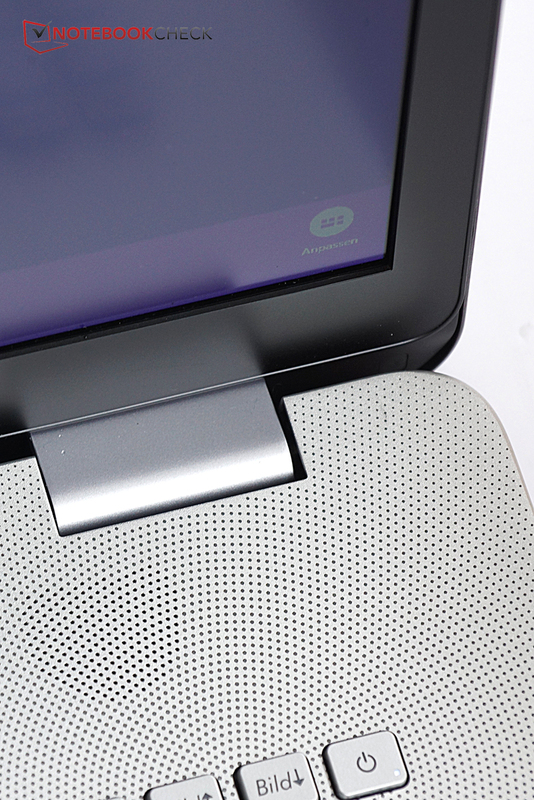 The top of the base unit with its slightly roughened metal surface and the nice status LEDs at the front is very nice; the touchpad has a chrome edge that also improves the design. Speaking of chrome edge: The predecessor had a surrounding frame around the base unit, but that is gone now. The bottom of the notebook is made of plastic, but is not the same color as the other metal parts and is now black. This is unfortunate and rather incomprehensible; thanks to the uniform color scheme, the design of the predecessor looked more sophisticated. 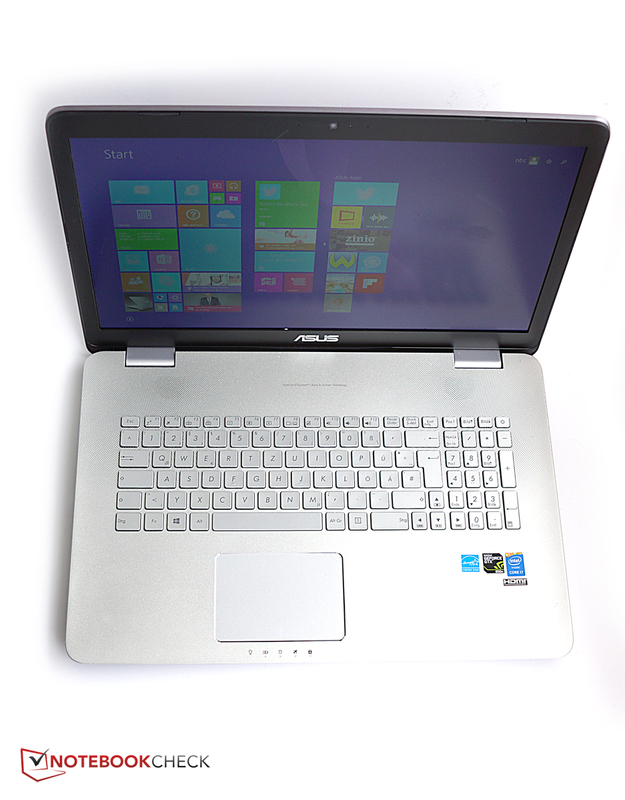 The Asus N751JK-T4144H is 5.6 millimeters (~0.22 in) higher than the predecessor and is also slightly heavier. The stability of the base unit is okay and even heavy pressure is not a problem. On the other hand, the lid can be twisted quite significantly, which also creates heavy picture distortions. 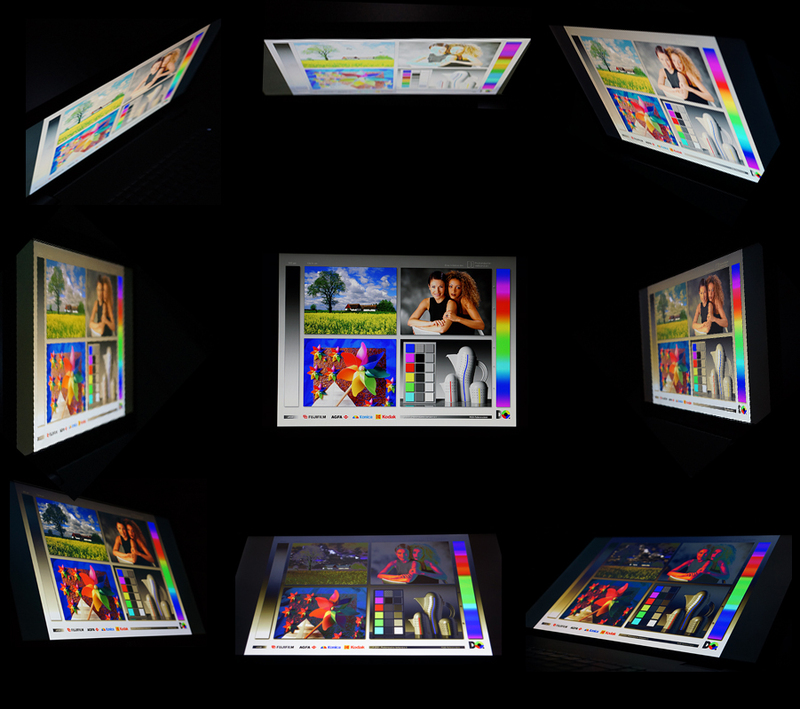 Pressure on the back of the display also results in visible color changes on the screen. Overall, there are some details of the new chassis that we like: The very elegant looking status LEDs at the front, for example, or the speakers located above the keyboard. We do not really like the black plastic at the bottom that affects the look. The stability could also be better. 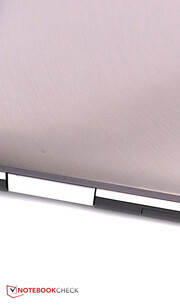 Asus has not really changed the port variety compared to the predecessor, but the separate stereo jacks for speakers and microphone are replaced with one combined 3.5 mm stereo jack. This is obviously annoying for anybody who uses a high-quality gaming headset with separate connectors for the headphones and the microphone. You still get four USB 3.0 ports, one HDMI port, one DisplayPort, an Ethernet port and a Blu-ray drive. Asus has reduced the number of ports slightly despite the larger chassis compared to the predecessor, which is rather sobering. Compared to the rival devices the connectivity is decent, the four USB 3.0 ports in particular stand out. However, all comparison devices have better audio ports and some notebooks also have a VGA port. One improvement over the predecessor Asus N750JK-T4042H is undoubtedly the support for the WLAN standard 802.11ac, which enables much higher transfer rates compared to 802.11n. The signal quality has also improved: We still have the full signal at a distance of ten meters (~33 ft) and through three walls, but it takes noticeably longer to open web pages compared to when it is closer to the router. Wired networks can once again be used via the fold-out Gigabit-Ethernet port. We had praised the generous package of accessories including a mouse and the external subwoofer in our review of the Asus N750JK-T4042H, but it seems the manufacturer did not really listen to us: Although you still get the subwoofer, the mouse has been dispensed with. A useful addition is the provided zip ties, especially if you are often on the road with your notebook. 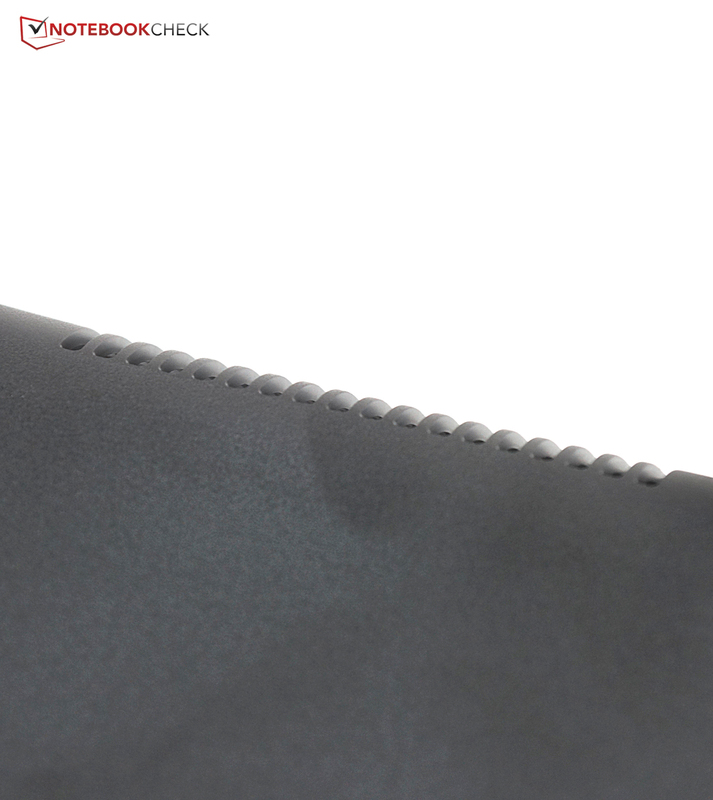 The box also contains a nice power adaptor, which shares the design philosophy of the notebook with rounded corners. There is only one maintenance hatch this time. 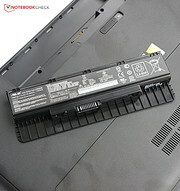 The battery can now be removed from the outside, which is an advantage over the predecessor. However, it is, slightly more complicated to lift the bottom cover; instead, there is a maintenance hatch that allows access to the memory as well as the two hard drive slots. More effort is required to clean the fan: You will have to remove the rubber feet on the bottom cover, and the screws have to be loosened carefully and the bottom panel opened with a screwdriver. Asus offers 24 months of warranty. The manufacturer will pick up the device from your home and return it after the repair. Alternatively, you can contact the retailer who can handle the warranty processing for you. A warranty extension to three years is available via Asus. It is 10 Euros (~$11) more expensive compared to when the Asus N750JK-T4042H was reviewed and now costs 79 Euros (~$89). It is possible to get the extension within the first 12 months after the purchase, and there is also an international warranty that can be used in many countries around the globe. The keyboard has been adjusted slightly, mainly caused by the lack of the dedicated power button and the button for the Asus settings above the keyboard. The power button is now located in place of the "End" key right above the numeric keypad in the keyboard layout. This obviously means you could hit it accidentally during typing and either shut the notebook down or put it into standby depending on the settings. Another problem that we had already criticized in the last review is the lack of clarity: The keys are crowded with secondary functions and symbols. 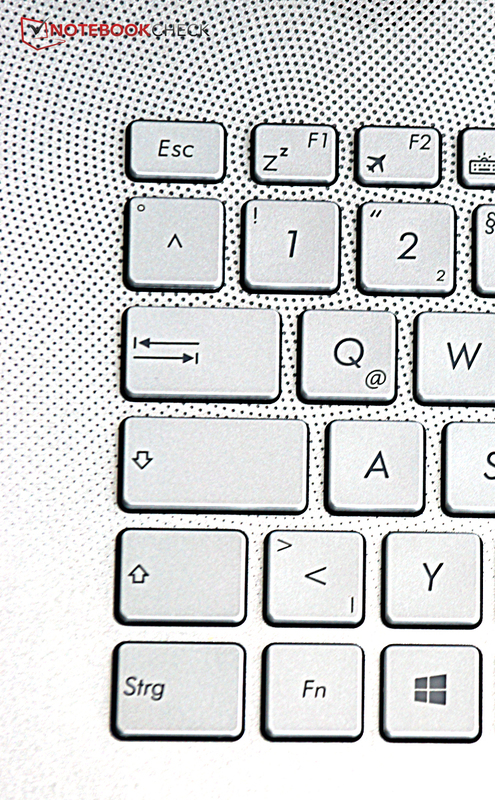 The arrow keys are not separated, and result in a narrower "0" on the numeric keypad. 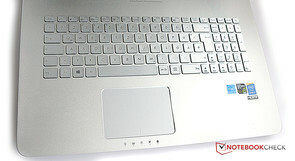 The white keyboard illumination can be adjusted in two steps and you can obviously deactivate it completely. As with the predecessor, this is actually recommended in bright environments because the white light combined with the silver keys cannot create sufficient contrast, and consequently affects readability significantly. There are obviously some positive aspects of the keyboard: You get a good feedback for inputs, the stroke is smooth but firm, and the stability of the keyboard is very good. The layout is also quite logical and supports fast typing. 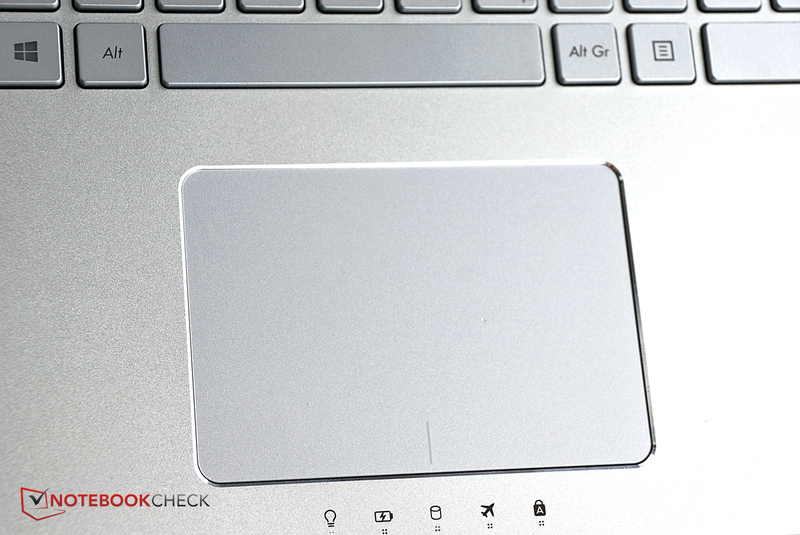 The ClickPad consists of only a touch-sensitive area and does not have any dedicated buttons. 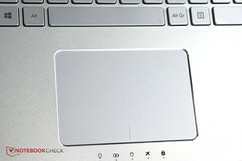 Clicks can be triggered with inputs on the corresponding side at the bottom of the touchpad. The clicking surface is touch-sensitive, which can sometimes result in a less precise handling compared to a touchpad with dedicated buttons. However, the quite large surface with a diameter of 12.5 centimeters (~4.9 in) provides good gliding capabilities. 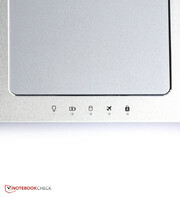 Multi-touch gestures like scrolling with two fingers or zooming are executed quite reliably. The buttons create a rather hollow sound when you click them, which could have been of better quality, but they work reliably and provide a good feedback. 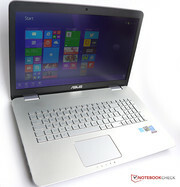 The Full HD resolution has become the standard for multimedia and gaming notebooks. It does not have to be any higher right now, and even very powerful mobile graphics cards still have problems with the maximum settings in higher resolutions. The Asus N751JK uses a Full HD display with a matte surface, which means you do not have many problems with reflections, but the colors are usually rather pale. The panel from AU Optronics is impressive with a comparatively high maximum brightness of 347 cd/m² in our measurements. However, a brightness distribution of 76% is not that good, resulting in brightness differences in large colored surfaces. 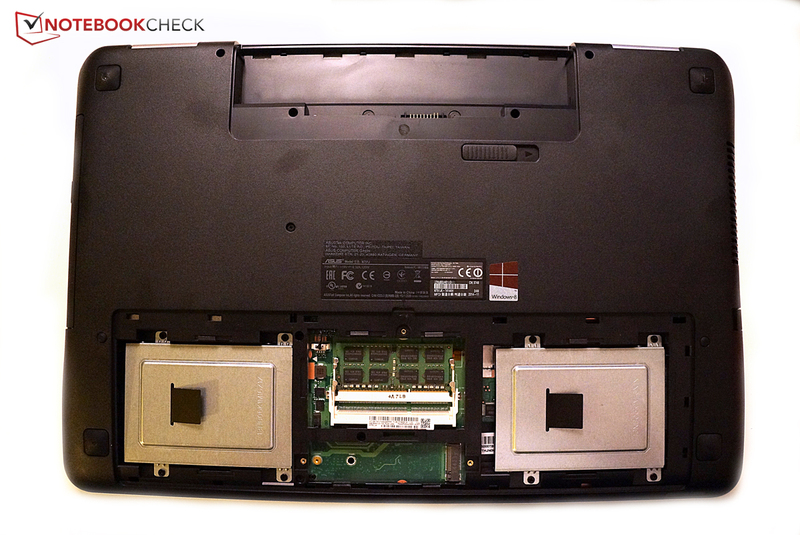 We can also notice screen bleeding from the background illumination at the sides on dark areas. The contrast ratio of 510:1 is one of the lowest among the rivals, mainly the result of the rather high black value of 0.68 cd/m². This means that black areas still have a brightness of 0.68 cd/m² and look more like dark gray than deep black. 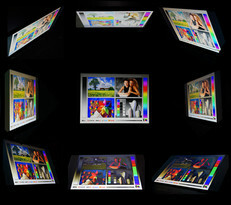 Colors are generally quite vivid on the display, but they are not as rich compared to other panels. White areas are not pure white, but have a slight purple cast. We check this subjective impression with the software CalMAN and a spectrophotometer: We evaluate the uncalibrated panel with the factory settings first. Here we can see that almost every color deviates from the sRGB reference color space because they are oversaturated. Dark blue tones in particular, are a few shades too dark. The grayscale on the other hand, is quite accurate and we can only notice a slight blue cast, but this is not visible to the human eye. Unfortunately, calibration does not really improve the accuracy of the colors: The average DeltaE deviation from the reference color space sRGB can be slightly reduced, but most colors are still too dark. The grayscale performance is even worse; white in particular, has a higher deviation than before and suffers from the previously mentioned purple hue. Overall, the calibration is not a huge success and even tends to increase the deviations. As a result, the panel is not suitable for professional users. However, when compared with the rivals, we actually have to praise the panel of the Asus N751JK for the comparatively low color deviations ex-works. With a weight of 3.4 kilograms (~7.5 lb), the Asus N751JK is not really a portable device. If you use it outdoors, you should avoid direct sunlight. Even though the panel surface is matte and does not create strong reflections, you can hardly see anything on the screen in direct sunlight. However, bright environments in general are not a problem for the N751JK and thanks to the anti-reflective panel and the decent brightness, you can actually use it outdoors. Places in the shade or indoors are not a problem for the visibility anyway. The TN LED panel provides typical viewing angles for this display technology: Decent with horizontal shifts, but quite mediocre with vertical changes. More precisely: You have to live with brightness shifts and a reduced contrast, if you look at the screen from above or below. However, this is tolerable in the case of the Asus N751JK and the deviations appear comparatively late, so you can still work properly with the display. 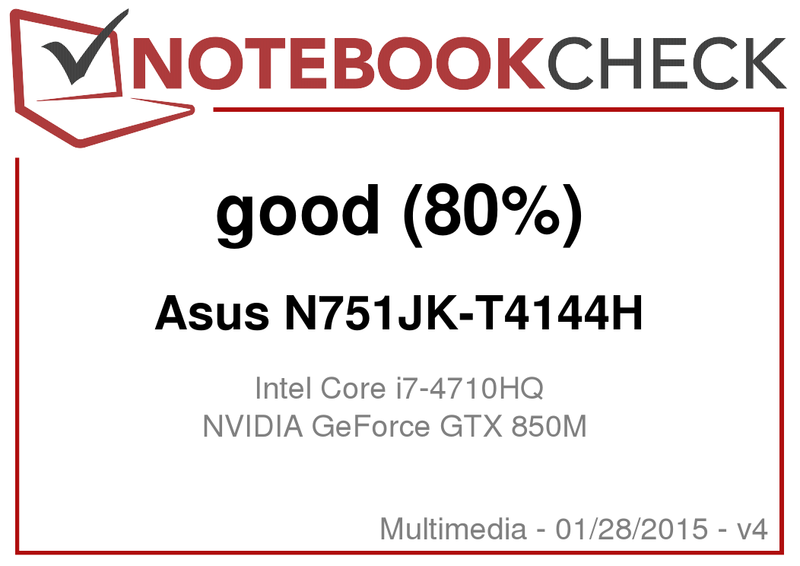 Currently, you can only get the Asus N751JK with the Intel Core i7-4710HQ and GeForce GTX 850M configurations in Germany. All models are equipped with 8 GB of memory, and our review unit uses a 128 GB SSD and 1 TB hard drive. 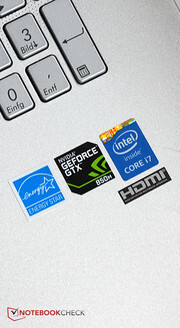 Many comparison devices use the same processor, and the graphics card is also very popular. 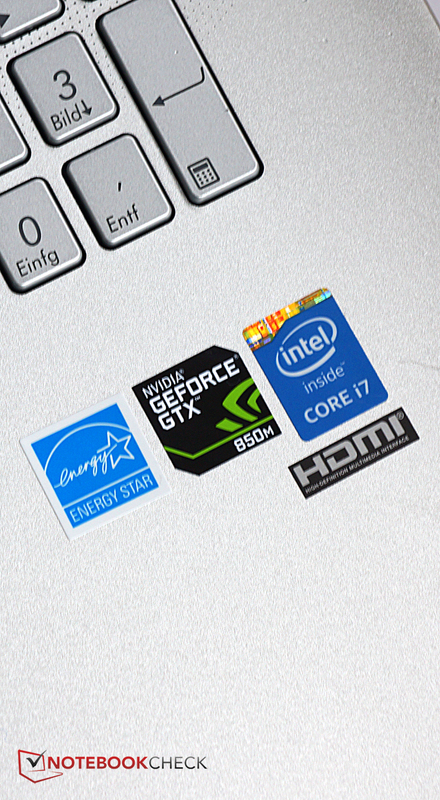 On the other hand, entry-level gaming notebooks are usually equipped with the slightly faster GeForce GTX 860M. 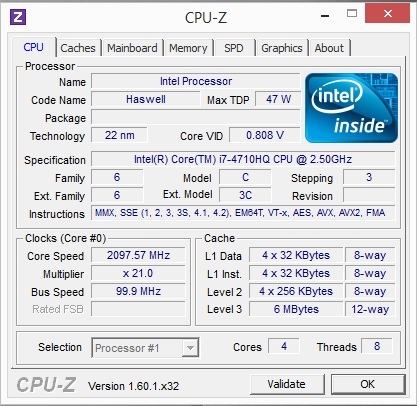 The Intel Core i7-4710HQ is a quad-core processor with a nominal clock of 2.5 GHz, but it can reach up to 3.5 GHz via Turbo Boost (Turbo limits: 4 cores: 3.3 GHz, 2 cores: 3.4 GHz). 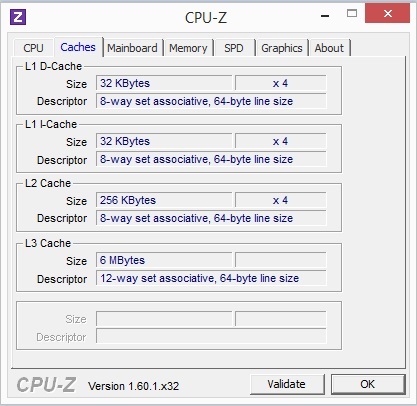 The processor supports Hyperthreading, so the four cores can execute up to eight threads simultaneously. We could not notice any delays during our review and all tasks were executed quickly. The Cinebench results are usually on par with the comparison devices that use the same processor. 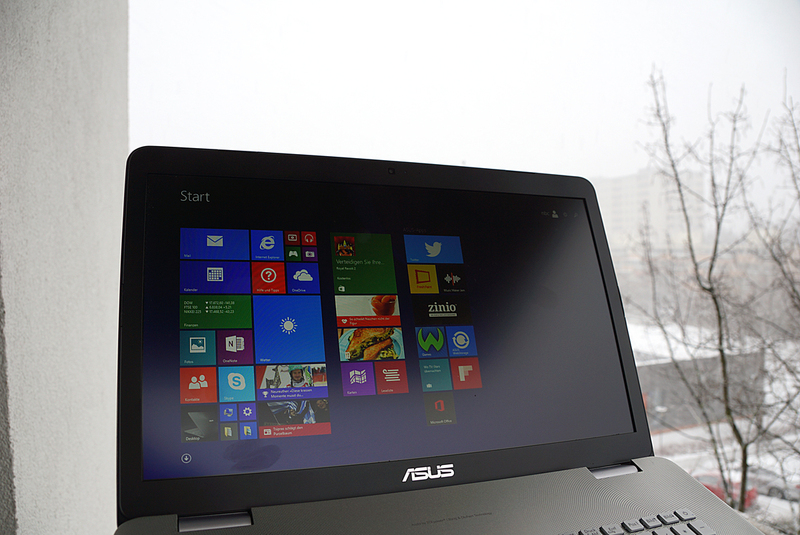 Overall, we can see an advantage of roughly 10% compared to the slightly slower Core i7 of the Asus N750JK-T4042H. The Turbo utilization depends heavily on the selected power profile: You can use the maximum Turbo clocks on battery power with the "High-Performance" setting, but the clock drops to 800 MHz on battery power and is only raised to the maximum Turbo clock under load with the "Balanced" profile. This is also the case with mains power, but the clock is sometimes increased, while it remains constant at 800 MHz on battery power. 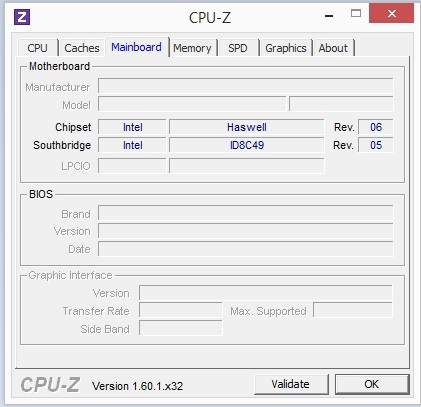 The CPU behavior with the "Energy-Saving" profile is very similar to "Balanced". The spec sheet shows that the Asus N751JK uses quite a balanced configuration: The fast processor will not affect the graphics card, and the SSD ensures fast transfer rates for gaming. The memory is also sufficient. 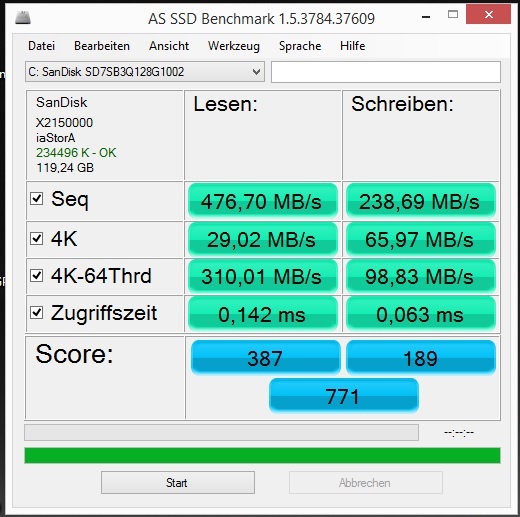 According to the PCMark benchmarks, the Asus N751JK-T4144H is roughly on par with the comparison devices and has – probably because of the SSD in particular – a small advantage over its predecessor. The 128 GB SSD is provided by SanDisk and the capacity is quite limited if you install some applications in addition to Windows 8.1. On the other hand, you get better read and write transfer rates compared to many rivals. You also get a 1 TB hard drive from Seagate, but it only works with 5,400 revolutions per minute. This results in long loading times for games like "Dragon Age: Inquisition". You might want to think about a configuration with a larger SSD or upgrade more SSD storage later when you consider the low SSD prices at the moment. The GeForce GTX 850M is a mainstream graphics card and we expect the successor shortly. It has already been used for the Asus N750JK. Our current review unit has 2 GB DDR3 video memory, but you can also get models with 4 GB of memory. Our benchmarks show that the performance of the GPU is on the expected level: Roughly 15% behind the rivals with the GeForce GTX 860M, and on par with the predecessor as well as other comparison devices with the GeForce GTX 850M. The performance of the GeForce GTX 850M is heavily reduced on battery power, even with the "High-Performance" power profile: The 3DMark benchmarks only determine 50% of the points in this case. Annoying: Dragon Age only ran in the "Windowed Fullscreen" mode on our review unit, and we also had to enlarge it manually. We were not really impressed with the gaming performance of the predecessor, and that was six months ago. By now we have a few new GPU demanding games like "Far Cry 4", "Assassin's Creed: Unity" or "Dragon Age: Inquisition" and the GeForce GTX 850M clearly has problems with them. The situation will be similar for all current 3D games if you do not want to play with low or sometimes medium details. The performance is even lower on battery power. 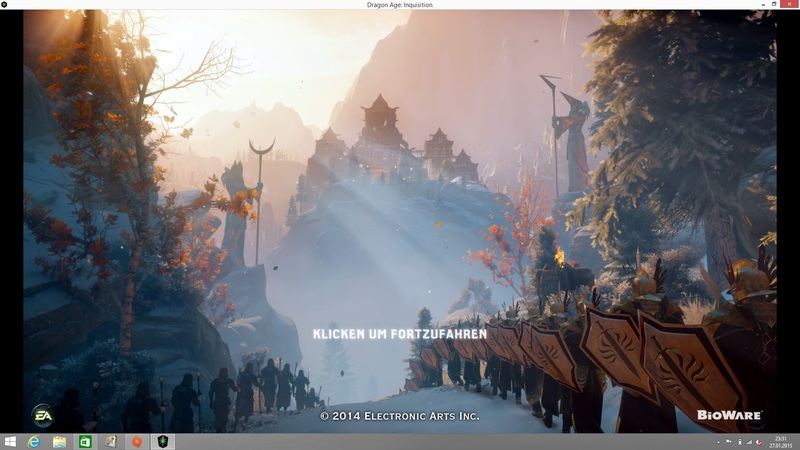 Once again, "Dragon Age: Inquisition" showed the annoying behavior that we could not play it in fullscreen mode, just like in the review of the MSI GS60. There was also a significant performance drop when you select beyond the low settings. This is probably a result of the slow and rather limited graphics memory of 2 GB. There are also problems in the game "Thief" that we tested for a better comparison with the Asus N750JK: The frame rate was very low in the benchmark. We did have the feeling that the frame rate was not as low as indicated by the benchmark when we actually played the game, but it was not really an enjoyable experience with medium settings. FurMark also resulted in a very low clock for the GeForce GTX 850M. 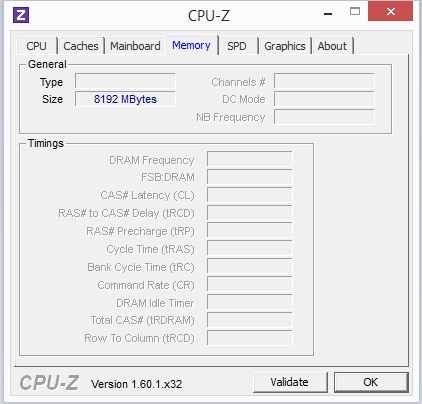 There might be a driver issue, since the graphics card does not reach very high temperatures and therefore does not have to throttle, but the clock is already very low to begin with. These drops in the clock can usually be fixed with a driver update, but we will deduct points in the rating until this update is available. The predecessor was already quite quiet, we could only hear a slight murmur even under load. The Asus N751JK is on par, even though the maximum noise under load is slightly higher with 42 dB(A), but our review unit is still hardly audible with up to 31.8 dB(A) while idling. The Asus N751JK is also a very quiet notebook compared to the rivals: The HP Envy 17, for example, is much louder under load with up to 52 dB(A), and the other comparison notebooks are also slightly louder than our review unit. Asus has also used the redesign to improve the cooling solution; the results are much better compared to the predecessor, although the warming of the Asus N750JK has already been quite low. The Asus N751JK-T4144H with a faster processor and a higher ambient temperature is even cooler under load with up to 41.3 °C (~106 °F) at the bottom and up to 38.1 °C (~101 °F) at the top. This means the maximum temperature has been reduced by 8 °C (~15 °F) at the top, which is quite impressive. The temperature at the bottom is also 2.9 °C (~5.5 °F) lower compared to the predecessor. The only drawback is the slightly higher temperature on the palm rest of the Asus N751JK-T4144H, but up to 31.6 °C (~89 °F) is only going to be an issue for very temperature-sensitive users. The idle temperatures are slightly lower as well and once again, the warming is hardly noticeable. A comparison with the other devices shows that the Asus N751JK-T4144H is definitely one of the coolest devices in this category. 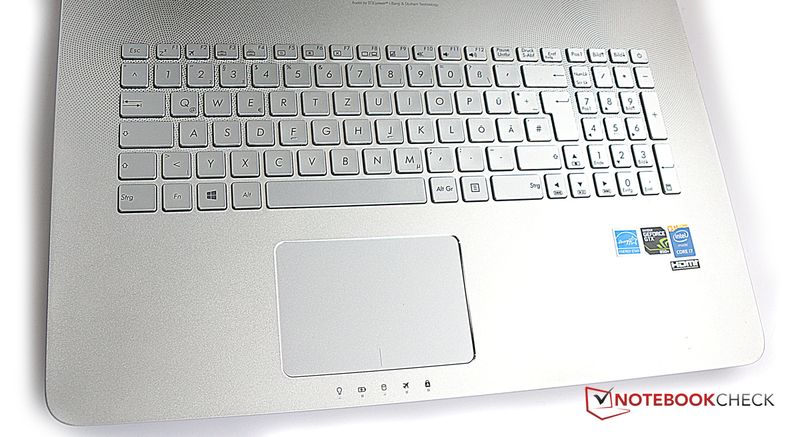 Only the HP Envy 17 with a low voltage processor manages slightly lower temperatures. We simulate maximum load for the graphics card and the processor with the stress test and the device stays quite quiet and does not really get warm, either. The GPU temperature of around 60 °C (~140 °F) is tolerable, but the CPU quickly reaches temperatures above 80 °C (~176 °F) and then throttles the Turbo clock to a minimum value of 2.4 GHz. The clock of the GeForce GTX 850M drops significantly quite quickly and runs with only 135 MHz, so gaming is hardly possible. The situation does not change when we only stress the graphics card with FurMark, and it corresponds with our problems in some games. We hope that this is a driver issue that can be fixed with an update, but it still affects our rating. (+) The average temperature for the upper side under maximal load is 31.3 °C / 88 F, compared to the average of 30.9 °C / 88 F for the devices in the class Multimedia. (+) The maximum temperature on the upper side is 38.1 °C / 101 F, compared to the average of 36.5 °C / 98 F, ranging from 21.1 to 71 °C for the class Multimedia. (+) The palmrests and touchpad are cooler than skin temperature with a maximum of 31.6 °C / 88.9 F and are therefore cool to the touch. (-) The average temperature of the palmrest area of similar devices was 29.1 °C / 84.4 F (-2.5 °C / -4.5 F). 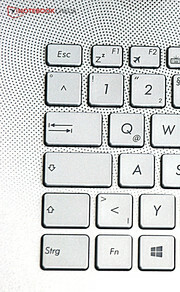 The speakers are slightly reduced: Instead of four speakers under the front edge, there are now only two speakers above the keyboard. However, we do not really think this is a limitation because all four speakers of the N750JK were located at the same place and could not create a real surround effect anyway. The power of the sound system has not been reduced; at least this is our subjective impression: You still get one of the best sound systems that is currently available in a notebook. The sound is balanced and nuanced; the speakers have no problems with distortions. How does Asus manage this? We think the location of the speakers above the keyboard is an advantage over the predecessor, and you get a stereo jack for the provided external subwoofer located on the right side of the notebook. It is very powerful, but the sound quality is already quite decent without the subwoofer; the maximum volume of the speakers, optimized by Bang & Olufsen, is impressive. You can adjust numerous settings with the "Audio Maxx" software or select one of the predefined profiles. There is also a full equalizer if you want to change the settings manually. This does change the sound noticeably, and you can even enhance the bass, which results in a real wow-effect. The power consumption of the Asus N751JK-T4144H is significantly different from the predecessor in some scenarios. This is surprising, since most components are either identical or very similar. The minimum idle consumption of our review unit is slightly higher compared to the predecessor: 8.4 Watts is pulled from the power adaptor or the battery. On the other hand, the maximum idle consumption is slightly lower with 13.3 Watts. The average load consumption of both devices is quite similar, while the maximum consumption of 90 Watts is much lower compared to the 118.6 Watts of the predecessor. The Asus N751JK-T4144H is quite frugal compared to other rivals from this product category. The idle consumption in particular, is among the lowest results within the competition. Asus has reduced the battery capacity significantly: While the Asus N750JK-T4042H still had 69 Wh, the successor has only a 56 Wh battery. At least it is easy to remove the lithium-ion 6-cell battery. 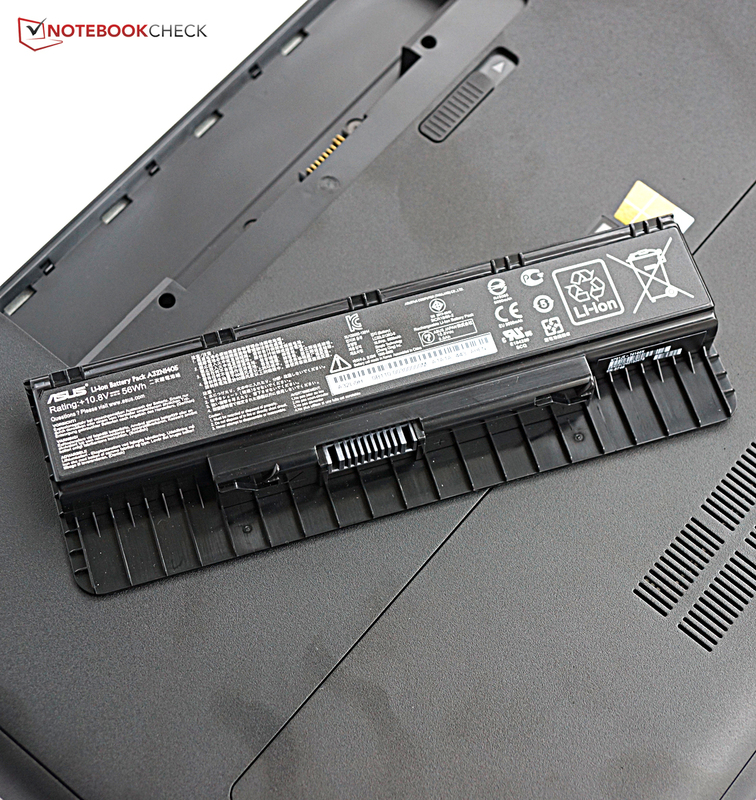 A look at the competition shows that the battery capacity is actually still quite decent: Many other devices like the Acer Aspire V3-772G or the Toshiba Satellite L70-B-130 only have a module with 48 Wh. The smaller battery is noticeable in our battery runtime tests of the Asus N751JK-T4144H: Overall, the successor managed 20% longer results when you take in all the tests, but the difference is much smaller in the more realistic WLAN test with 8%. Many rivals have problems in this scenario, so the result of almost 5 hours for our review unit suddenly looks quite good. Watching a Blu-ray movie is possible for 4:17 hours, which is enough for two long films. Gaming with the notebook is only possible for 47 minutes (Middle Earth: Shadow of Mordor, medium settings). 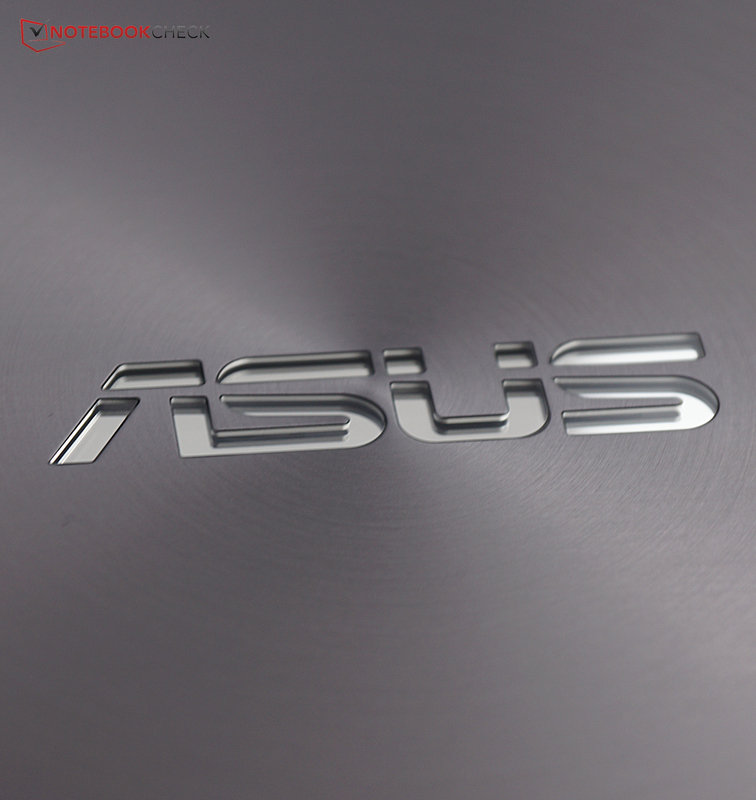 We are impressed by the Asus N751JK-T4144H. 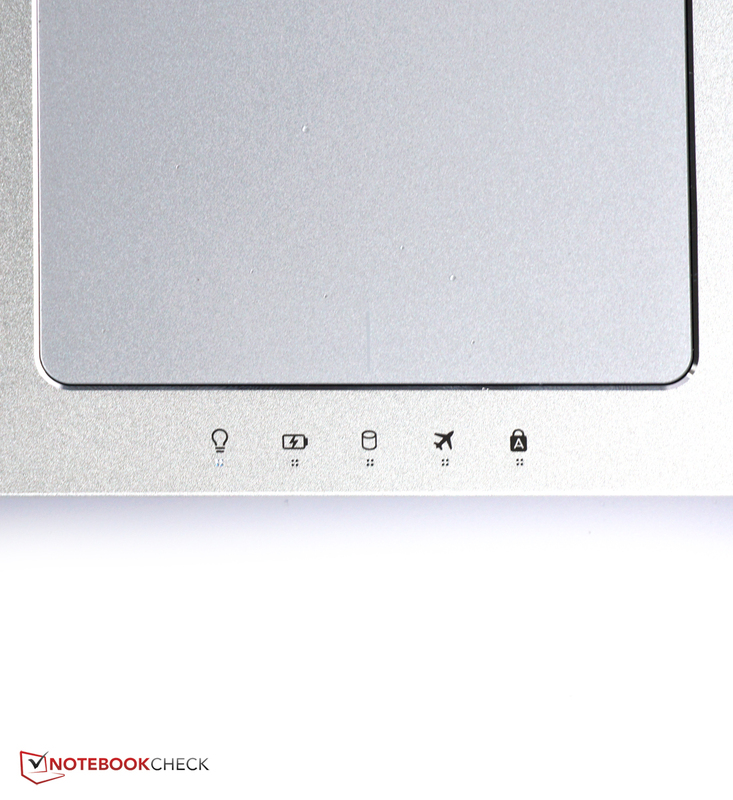 It is still a great multimedia notebook, but the update seems to have more advantages for the manufacturer than for the customer. Cost-cutting measures like the omitted dedicated power button and the missing accessories are clear cutbacks. The chassis is now bulkier as well, maybe as preparation for better processor and graphics cooling in the future generations. The update to the N751JK generation does obviously have some advantages for the customer as well: The device is now even cooler than before and thanks to the slightly faster processor, is also rather more powerful. The location of the speakers is better and it is now possible to use fast wireless networks, according to the 802.11ac standard. 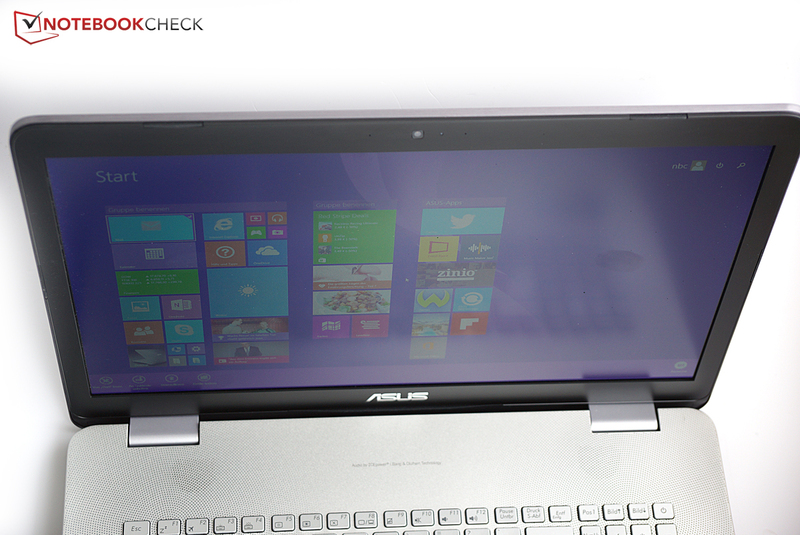 Asus also offers an optional matte IPS display and thanks to the SSD, the operating system is very fast. Nothing has changed in terms of gaming performance, but now we have some new GPU demanding games like "Dragon Age:Inquisition" and "Far Cry 4", which means the Nvidia GeForce GTX 850M has even more problems with current games. If you really want to play games now and in a few years to come, you will have to invest in a notebook with a GeForce GTX 970M or 980M at a higher price. 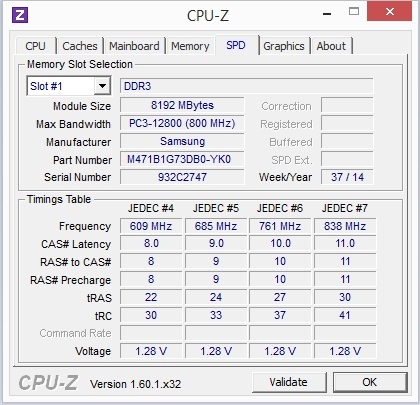 Our Asus N751JK review unit also suffered from strange clock reductions of the GTX 850M, even though we could not observe the issue in every game. We can just hope that Asus can fix this problem with a patch, but there is a significant point deduction in the gaming sub rating until then. If you want to play occasionally and enjoy watching movies, then the Asus N751JK-T4144H is actually a powerful home cinema with excellent sound that can compete with some stereo systems. The input devices are decent, the chassis is still sophisticated and the device always stays cool and quite quiet. However, you might want to think about getting the Asus N750JK, if it is available, at a lower price, and then equip it with an SSD. It has a slightly nicer and slimmer chassis, but virtually the same performance figures. In Review: Asus N751JK-T4144H. Test model courtesy of Cyberport. 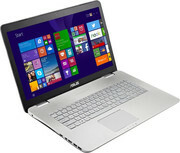 Many users appreciate the Asus N-series for the great sound and the sophisticated constructions. But we think that some aspects of the current 17-inch generation with the designation N751JK are a step in the wrong direction. You once again get the great sound system with an external subwoofer that creates powerful bass. The speakers are now above the keyboard, but this time you only get two instead of four. Asus also changed some details of the chassis, even though that was not necessary in terms of design. We actually liked the predecessor even more. Instead of a silver bottom cover you now get a black one and you can see it is made of plastic, which affects the quality impression. The lid still has a nice design and is made of aluminum. The chassis is also slightly heavier and a bit thicker than the predecessor. 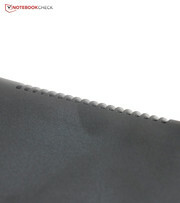 But it is not really sturdy, either: Pressure is quickly visible on the screen. Advantage: The battery can now be removed. Small drawback: Instead of generous access you only get a maintenance hatch. Asus also changed the keyboard. The excellent stroke and the good feedback are fortunately unchanged. But Asus did not change the somewhat crowded layout with the confusing lettering, either. Not really perfect: The power button sits right above the numeric keypad. In theory, you could trigger it accidentally, even though that never happened during our review. The white keyboard illumination is also a bit annoying on bright days because you cannot read the lettering anymore. The status LEDs got a nice new design. 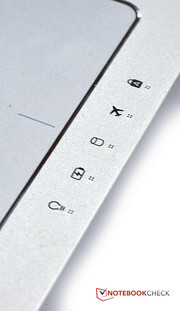 They show the charging status of the battery, the hard drive activity, the status of the Caps Lock, the operating mode and the flight mode. The clickpad is good, but the keys are a bit loud. Inside is a GeForce GTX 850M, but the performance drops significantly in some benchmarks and applications. IPS displays are now available as well, but our review unit uses a TN LED panel with a decent picture quality and Full HD. There is no criticism for the cooling solution, it is hardly audible in the majority of scenarios, yet the case temperatures are never really warm. The webcam above the display is okay for the occasional video chat. The battery is much smaller compared to the predecessor, but still delivers practical battery runtimes. 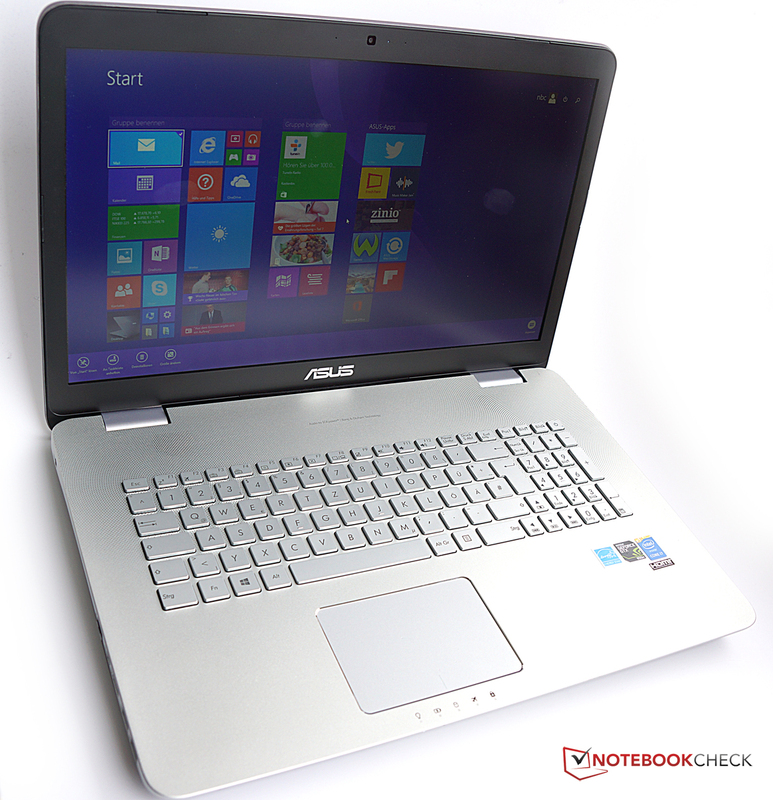 The Asus N751JK is still a good multimedia notebook, but the predecessor had a better price-performance ratio. 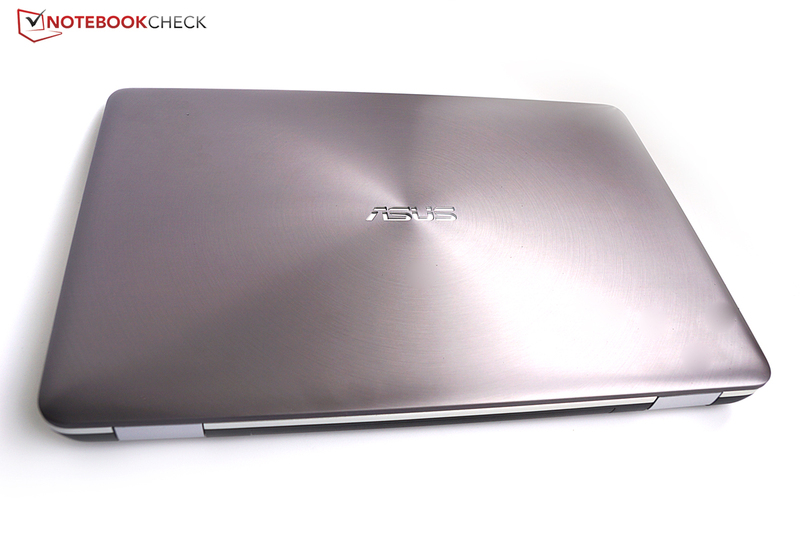 The Asus N751JK is still a very stylish notebook with a great sound system. We liked the old case better. That the new generation from Asus is bigger and heavier, it is usually the other way around.